16 years, 5 months, 25 days old age. Prayas Ray Barman will turn 17 on 25 October, 2019. Only 6 months, 5 days, 4 hours, 13 minutes has left for his next birthday. Prayas Ray Barman has celebrated the total number of 16 birthdays till date. See the analysis by days count and bar graph. Prayas Ray Barman was born on 25-10-2002 in Durgapur in the state of West Bengal, India. He is an Indian Cricket Player. 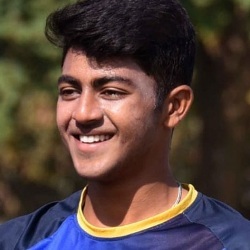 Prayas Ray Barman began his career by playing for Bengal in the year 2018-19. He had an impressive outing in the 2018-19 Vijay Hazare Trophy and got noticed from there. He became the youngest player to be bought in IPL after he was bought by RCB at the IPL player auction for INR 1.5 crores. He also became the youngest player ever to play in an IPL match after he made his IPL debut against Hyderabad in IPL 2019. He was just 16 years old when he made his IPL debut.